Sleep: Comes easy this week, and naps too! Miss Anything? *awkward moment* being intimate with Justin-on pelvic rest for who knows how long, been a few weeks already! Today was a great day! I had my first official prenatal pregnancy appointment...it went great! 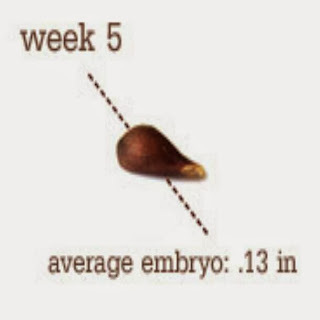 Based on my last period I should be about 10 weeks, but I knew with my first ultrasound I was no where near that, but if you've been following you know my numbers were rising and everything is going well, just meant I probably ovulated later than "normal" which at this rate I dont care as long as I get a healthy baby in the end. 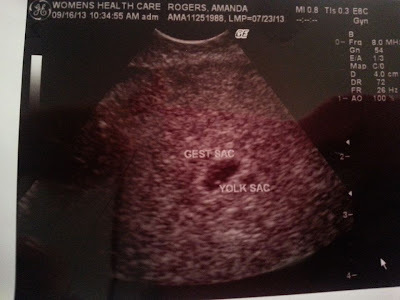 Todays ultrasound was a lot more detailed (as there was a lot more to see now) and I got to see the heart beat, and the babe wiggle around-so magical! Its crazy to think something that starts out so tiny turns into a little person in such a short amount of time. Anyways, Im measuring 6 weeks 4 days along, which puts my due date at May 19th 2014! 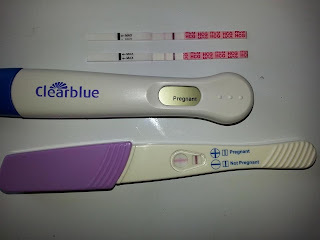 So I feel liek the pregnancy isnt "progressing" because the day I found out I was pregnant I was guessing I was 6 weeks, and that was 3 weeks ago. 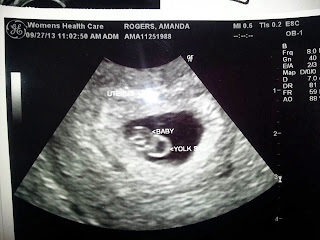 Then of course the first ultrasound proved to be that I wasnt as far along as I should be and now this week just confirmed it all. Im doing great though and so is baby, so that's what counts! A lot of things have changed at my clinic since my last pregnancy. Now they dont do the heartbeat doppler-they always measure it with the vaginal ultrasound, which is cool but akward. Either way more oppurtunities to see the babe so no complaints! 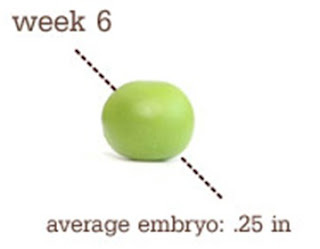 Another thing the doctor mentioned (not that I NEED it) but they measure your cervix at 20 week ultrasound and if its too short (I guess you want it long) they can help make it longer? I didnt fully understand but I figure why ask questions too soon hah. Oh oh another great thing is my chance of miscarriage goes down this week, 25% of embryos are miscarried by the sixth week and after the 6th week (which i am!!!) the chance goes down to 2%, I can beat those odds, right?! He seems pretty confident and he's been at this for 26 years with a lot of success so I am trusting him that everything will be okay! Needless to say Im over the moon excited, anxious and nervous! Think everything is still going fine, based on my countless trips to bathroom and never enough tums to keep my tummy happy, but this is all GREAT signs that baby is growing and getting comfy. He/she has about 32 weeks to go, so better stay put! Miss Anything? Caffiene...but Idid get a caffiene free pumpkin spice latte! Food cravings: Water-constantly thirsty and drink literally a gallon a day, also candy corn, I'm in luck its in season right now! Looking forward to: My next visit to the lab and hopefully doctor this week or next! Most people dont see a doctor till 8-10 weeks but mine assured me that with my history, for peace of mind he will let me come in weekly if necessary for the whole first trimester. Based on my last menstural cycle, my estimated due date is May 3rd, which is coincidentally my Great Grandma's birthday. Of course this date probably will change once I have an ultrasound, but I'm guessing May 2014 Jaelynn will be a big sister.